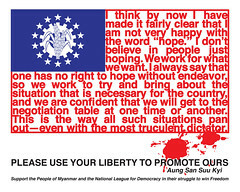 Design prompted by disturbing news from friends in Burma. After decades of proclaiming itself the protector of Buddhism (to secure legitimacy), this regime repeatedly brutalises its peaceful, devout people. International pressure for concrete action is increasing, especially among ASEAN, which considers Burma strategically important. Its policy of non-interference may soon change as state failure carries widespread ramifications for the geopolitical stability of the region.